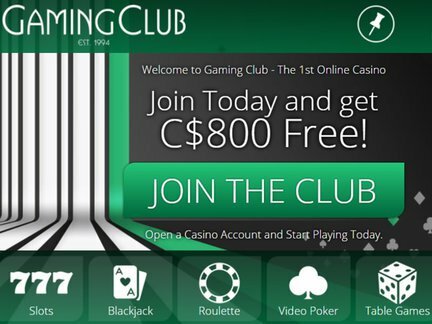 Not everyone wants to spend a fortune to play their favourite casino classics, and this is why so many Canadians enjoy the free games at Gaming Club. The venue, operated by Belle Rock Entertainment, is one of the oldest on the internet having been established way back in 1995, and it makes use of the technologically advanced Viper software from a company known as Microgaming, which has been in existence since 1992. With such a combination and a license out of the jurisdiction of Malta, everyone can rest assured that they will have an exciting experience unlike no other each and every time they visit. There are a host of free games at Gaming Club from which users can select, and many of them are available with no download or registration required. There are more than 150 titles available to be enjoyed in-browser so choice should never be an issue here. Slots are certainly a fan favorite, so individuals can spin the reels for a chance to win a virtual progressive jackpot at any time of the day. Otherwise, there are plenty of card and table options like baccarat, roulette, craps, poker, blackjack, keno and others. Finally, anyone who is a fan of video poker will find themselves right at home here with plenty of exciting variants like Jacks or Better, 10s or Better and even Deuces Wild. Why Choose No Download Titles? Most of the time, when people want to enjoy their favorites without paying for anything, a download just seems useless. After all, why clog up a computer's hard drive with software when people can just get started with a few clicks in their browsers? Another thing to consider is that the software at this particular venue is only available for download by people who utilize the Windows operating system, so people who opt for Mac or Linux are a bit left out in that regard. The ability to enjoy games with Flash or Java technology makes things more universal for everyone. Another way to enjoy fantastic titles without ever spending a single red cent is to do so on the house's dime. Gaming Club offers up plenty of promotions to help players do just that. They offer up a free spins bonus, which is essentially a type of no deposit bonus, to help everyone get started. This consists of 30 rounds in a video slot machine, but individuals should note that they will need to meet play-through requirements in order to cash out any of the winnings they earn. Once these have been exhausted, individuals can also take advantage of the 100% deposit match of up to $100 which is a welcome offer for new depositors. Even this is made easy with the ability to add funds via credit cards, checking accounts and e-wallet service providers like FirePay and Neteller. In fact, using one of these two e-wallets affords individuals an extra 25% match on each and every payment they make!